Since all the other Arrowverse shows already have threads for the new season, and Flash doesn't even though it comes back before the rest, 'twas time to remedy that. What we know so far... Ralph, Cecile and Nora will be regulars, besides a visit from his daughter from the future, Flash gets a new costume, we know the main villain will be Cicada, who can dampen metahuman powers, and Spin will be a recurring villain. The Flash returns October 9th. Great poster! I am really looking forward to this season because of Nora. Nora is damn fine but considering she isn’t Dawn Allen I expect she isn’t the true daughter of Barry. She’ll probably get erased. Fudging a character's name? That would never happen in the DCW verse. Nora is adorable! I'm glad we get to see more than brief glimpses at last. I liked her narrations, the resonance with the series' history and Barry's past narrations. The character story driving it all was effective, and they made good use of Wally's connection to the Legends. Although I do wonder why Wally apparently isn't there in the future to teach XS about speedster stuff. Some nice DC continuity nods, like "Schway" as future slang from Batman Beyond, and the references to the Flash Museum and to Ryan Choi (Ray Palmer's successor as the Atom) making Barry's costume ring. And they even slipped in a nod to the pre-"Flashpoint," season 1 Easter egg of Ralph Dibny being listed among the fatalities in the accelerator explosion. STAR Labs having a whole lounge that nobody knew about but Joe is saved from implausibility by the sheer hugeness of the building. It's a nice set, complete with a Supergirl-style balcony for meaningful conversations. I loved seeing an unseen lounge being there the whole series. This show too often makes the world these characters inhabit seem so small. Often it’s been discussed here of unseen events that must happen to explain what we see. The writers actually acknowledge that to world build adds to the sense of reality. Like Barry’s old Flash suits actually being tied to specific episodes, villain fights. This show is nearing its 100th episode. That is a lot of history. The Arrowverse is becoming more and more Legion of Super-Heroes-centric, and I love it. Though they haven't (yet) explicitly revealed that this version of XS is a Legion member, "grife" and the Lightning Lad reference certainly imply a connection. And Brainiac 5 is now a regular on Supergirl, plus Nia Nal is apparently meant to be an ancestor of Nura Nal, aka the Legion's Dream Girl. Some nice DC continuity nods, like "Schway" as future slang from Batman Beyond, and the references to the Flash Museum and to Ryan Choi (Ray Palmer's successor as the Atom) making Barry's costume ring. She also name-dropped Lightning Lad. The Legion isn't formed until the 31st Century, so there can't be any connection between her and that group despite her referring to Lightning Lad. She's a Time Traveler; and from Earth 1, not Earth 38. Seriously? Comics? Time travel? You really can't imagine a scenario where she might be connected with the Legion? Well, it's not like the Legion has a long history of recruiting members from 1000 years in the past. Nerys Myk and The Realist like this. On the other hand, Nora's dad knows Supergirl, and her Uncle Cisco can cross universes at will, so she could've become aware of the Legion through Kara or Brainy. There could be a Earth-1 Legion as well. Anyway Nora was a nice character and I'm glad Wally got some stuff to do. Hopefully this is a better season than the back half last year and season 3. Cicada looks like one of those Ninja guys (like Shredder) from the Teenage Mutant Ninja Turtles movies. Oh yeah, the new suit. I still don't care for it much. It looks weird without the chin piece. Where can a Canuck watch the Flash this season? CTV dropped it entirely and only Legends and Arrow migrated to Space. WOW. Really good season premiere. 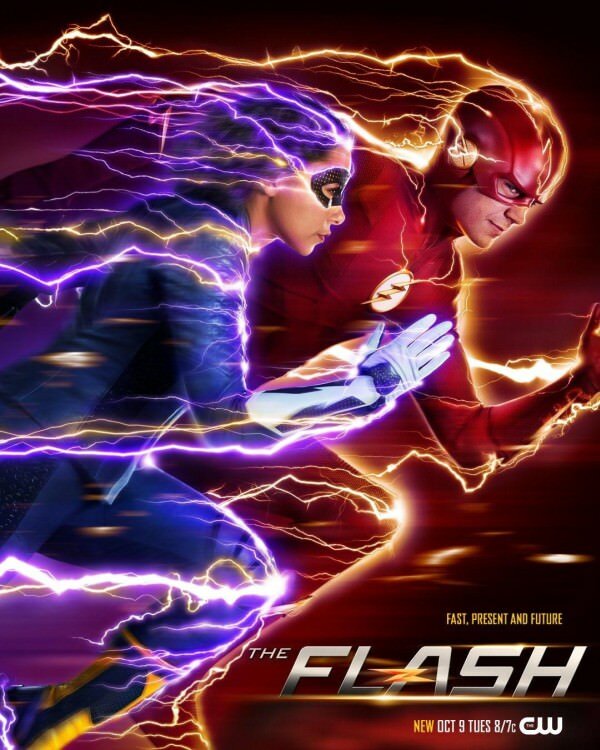 It had all the elements that I think make the flash a great show to watch: cast chemistry, humor, fun speed force action sequences and poignant character moments. I particularly liked the scenes with Iris and Barry talking about missing there firsts with their daughter and the follow up with Nora and Barry in the Time Vault learning that Barry disappeared for 25 years. Very poignant. - Is the episode hinting that Barry's crisis disappearance is a fixed point that cannot be altered and therefore he is doomed to disappear in the future? If true, it would mean that Nora is doomed to experience her dad out of order, spending time with him now but will lose him when she is an infant and Barry gets to know her now but will never see her as an infant. He will miss those firsts when she was an infant but is getting those firsts meeting her now. It is what made the scene in the time vault so poignant, you could almost see it on Barry's face, that he now knows that he will miss those firsts with her that he was lamenting to Iris about. Of course, the writers can do whatever they want but Wally's speech about fixed points of time could suggest that Barry's disappearance is one of them. I just think the show might be laying the groundwork for making Barry's disappearance a fixed point with all the implications it carries. Or maybe they do prevent Barry's disappearance but it changes Nora's future which leads me to my next point. - I also saw an internet theory that Nora will be erased from the timeline at the end of this season. I kinda hope they don't do that. I would feel cheated if after getting to know her over the course of so many episodes, the show basically hits the reset button erases her out of existence. And it would be super sad for Iris and Barry if they got to know her only for her to have never existed. Of course, the season could end with Iris being pregnant with Dawn. So Iris and Barry have these amazing experiences with Nora but lose her only to get the hope that they will have Dawn and get all those firsts with her.